Moonshine goes in one end. Lots of electricity comes out the other. Fremont, California-With stationary fuel cells hot again, Oorja Protonics is jumping into the market. In a few months, the company, which specializes in methanol fuel cells, will release a fuel cell capable of generating 5 kilowatts of power, enough to run a home or small business or to provide backup power to cell towers. It's somewhat small in size, as well. Check out the video: the 5-kilowatt fuel cell fits on top of a gurney. It is about the same size as a 500-watt device Oorja produced a few years back. "This will sit on large forklifts. You could use it for auxiliary power for trucks, RVs or marine applications, or for off-grid power for homes or farms," said CEO Sanjiv Malhotra. "This opens up a plethora of other markets." For larger applications, the fuel cells can be chain-ganged together. Connect twenty of them and they would be capable of generating 100 kilowatts of power -- as much energy as the recently unfurled Bloom Energy Server. Declining prices, federal and state incentives, growing demand for cleaner power and improving technology have begun to revive the fuel cell industry. Panasonic began to sell residential fuel cells to the Japanese market approximately a year ago while start-up ClearEdge Power sells 5 kilowatt systems in California. And last month, Bloom Energy came out with its server amid a worldwide frenzy of publicity. Oorja will largely try to distinguish itself on two grounds. First, the company can point to a somewhat large file (for fuel cell makers) of real-world customer experience. Last year, it introduced a 1.5-kilowatt fuel cell and over 200 of these have already been installed by customers such as Nissan and Safeway. Last year, Nissan estimated that 60 of the methanol fuel cells in its Smyrna, Tennessee factory will save it close to $500,000 in operating and battery costs. The new 5-kilowatt system is effectively a larger, improved version of the 1.5 -kilowatt Model 3. Second, Malhotra says Oorja will be able to undercut others in price. Whether or not the company succeeds in that regard remains to be seen, but it will make for an interesting debate. Bloom's Energy Server sells for around $700,000 to $800,000 (or $7,000 per kilowatt) before incentives, which can cover around half of the price. After incentives, Bloom claims its server generates power for 9 to 11 cents a kilowatt hour, a calculation that includes fuel, maintenance and hardware expenses. ClearEdge Power sells a 5-kilowatt fuel cell for $56,000, or more than $10,000 a kilowatt. ClearEdge initially sold its machine for $50,000 but subsequently raised the price. Malhotra declined to give a price for the 5-kilowatt machine, but said it will cost less than Oorja's Model 3 fuel cell, which generates 1.5 kilowatts and sells for $15,000, or $10,000 a kilowatt, before incentives. The 5-kilowatt machine is approaching the point where it can provide electricity for 20 to 25 cents per kilowatt hour, he said, including maintenance, fuel, replacement parts and other incentives. Federal and state incentives can cover half of the costs. The fuel cell also produces about as much heat as energy and that heat isn't included in the 20 to 25 cent figure. Thus, in many respects, Oorja seems to be ahead of ClearEdge, a more direct competitor, and trailing Bloom in terms of electricity by a few cents. Oorja, though, can provide customers heat for free, unlike Bloom, and address a wider market. Advantage, possibly, Oorja. "It will offer the customer a payback in less than 12 months," Malhotra said. "It is extremely competitive with the grid" when the added incentives are considered. 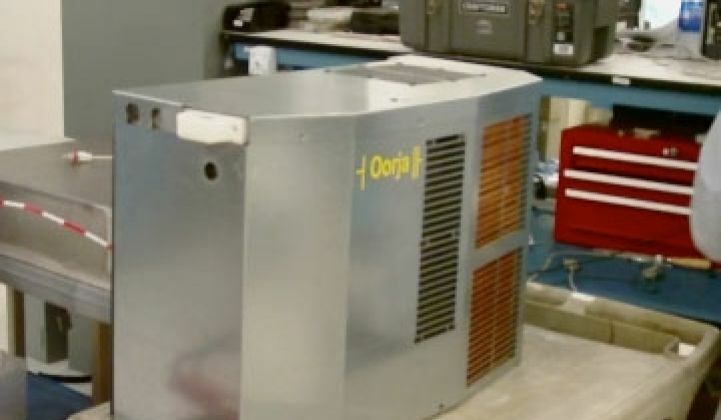 Oorja's fuel cells produce both heat and power. Only around 35 to 37 percent of the methanol gets converted to electricity. If the heat is added into the equation, the fuel cell becomes 70 to 75 percent efficient. ClearEdge claims it is close to 90 percent efficient with its heat and power fuel cell while Panasonic sells a 1 kilowatt fuel cell in Japan that is about 80 percent efficient when heat and power are both exploited. Bloom's server is about 56 percent efficient, but it only produces a marginal amount of heat. Most of the power generated is electricity, which tends to be a higher value form of energy. Thus, Oorja will likely more directly compete against ClearEdge and companies like Panasonic initially and aim for combined heat-and-power applications, such as hospitals, food processors or certain industrial sites where water needs to be boiled, rather electricity-only deployments. One of the primary underlying differences between Oorja and the other large fuel cells lay in the type of fuel it consumes. Oorja's fuel cell runs on methanol, similar to the fuel cells produced by Toshiba and others for consumer electronics. Most methanol fuel cells are small. Oorja's is about 50 times larger than the others. The fuel cells from ClearEdge and Panasonic run on methane. Bloom's fuel cell runs on methane, biogas and other fuels, but methane remains far and away the easiest to obtain. Naturally, each camp claims to have the superior idea: methanol proponents claim that the methane-to-electricity process is unduly complex while methane proponents say that methanol fuel cells can require a more rapid turnover of components. The debate, though, will be decided by buyers. Regardless of the type of fuel, all of these fuel cells can produce power at prices lower than solar, which costs 10 to 19 cents a kilowatt hour in California after incentives, with residential, distributed solar power costing them most. Wind costs less than power from fuel cells, but wind power is subject to weather conditions and generally gets generated in large, centralized power stations. Fuel cells deliver power locally. Fuel cells are also more efficient than the grid -- only about one-third of the power created in power plants makes it to your home -- so they can be considered clean forms of power. Oorja to date has largely produced methanol fuel cells for forklifts. Because the lead acid packs can only produce power for around four hours, large grocery stores and warehouses have to maintain battery swapping stations. Oorja's fuel cells, which fit onto the forklift, continually recharge the battery packs and allow the forklifts to go a full shift without any swaps. Although it landed a number of high-profile engagements and funding from Sequoia Capital, Oorja endured difficult times in 2009. The company came back from the brink with the Model 3, which both increased the power and dropped the price of its products. "With 1,500 watts, you can fill the bill with a lot of applications," according to CEO Malhotra. And what are the incentives? Buyers can get a federal tax credit for 30 percent of the cost of a fuel cell and California kicks in another $2.50 per watt. Oorja's 1.5 kilowatt Model 3 therefore goes for $6,750 after subsidies ($10,500 adjusted federal price minus $3,750 in California incentives). That comes to $4,500 a kilowatt. If the 5-kilowatt model stayed level with the Model 3 pricing, it would cost $22,500 not including operations or maintenance. Consumers can also get credits for feeding power into the grid via a feed-in tariff.